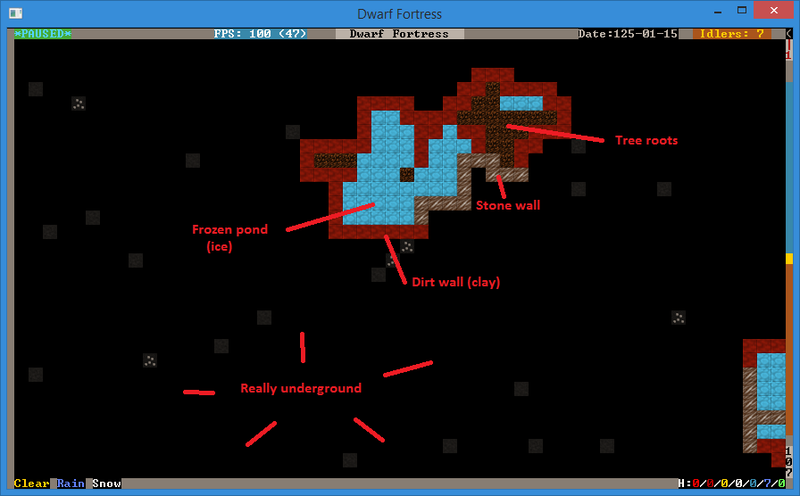 But all that is in the past Dwarf Fortress Walkthrough! It comes with a pre-made world and save and full game download for you to play along with. And a ton of screenshots. Yes, many, many screenshots. Download the walkthrough pack here. This tutorial uses a pre-configured install of DF, with the same save and all the extras you need - but no more. If that’s not going to work for you, see the guide to Setting up your install. After downloading the pack, you need to unzip the folder onto your hard drive (but not in Program Files). Then create a shortcut on your desktop leading to the launcher or directly to Dwarf Fortress.exe. Now we’re ready to get going! Click on your new shortcut, hit “Play” if you’re using the launcher, and you should get the screen below. So, you’ve got the game running and enjoyed the exciting ASCII intro movie. Well done! I can tell you’ll go far! Next step is to hit Enter on Continue Playing, which should be highlighted. You’ll then be presented with this screen. This is the save game list, which gets cluttered very quickly as seasonal saves build up. But for now all you have to do is use the down-arrow key (not the number pad arrow key) to select region1-post-embark. Hit Enter and the game will load. Once the game loads you will be presented with this screen. Although it’s confusing on first glance, don’t panic! It will all be made clear shortly. First thing though, hit Space to pause the game. Esc backs out of any menu you’re currently in. Lets talk about what you can see. First up, the screen is divided into three sections: The left shows the local view. The center shows the action menu, the right shows the area map. To make things a lot neater hit Tab, which cycles through various menu arrangements. Stop when your view matches the one below. While you examine your surroundings you should be able to spot tree trunks and the grassy areas easy enough, same with (frozen) ponds and the stream and bushes. 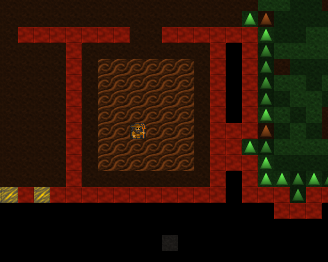 Other tiles won’t make much sense, these tend to be the slightly-arcane zones like open air spaces (pale blue tiles, or tiles with dots) and the earth (brown tiles) and slope or ramp tiles (upward triangles). The screenshot below should help point those features out. If you look on the bottom right of the window you’ll see we’re currently at level 108. To move between levels you need to hit < to go up, and > to go down. If you go up a level the map will look like image below. Try it yourself now. You’ll see that what was black dirt is now grass and trees. It’s like we’ve gone up a floor in a lift and we’re no longer looking at a slope, now we’re looking across a grassy plain. Below us is open space and tree tops. Make sense? Now, try going back down to 108 and then down to 107, a level below “ground” level. Your view should look something like this. We’re underground now with mostly dirt around and earth between the pool, the tree roots, and the rest of the ground. You may have noticed the pool doesn’t appear to have changed much, but don’t be confused. The difference is that on this lower level we’re on the same level as the body of the pool itself, at the level above, we’re actually above the pool a little looking at the top of it. Continue having a look around. When you’re done, return to Z-level 108 and find the wagon with our dwarves. The helpful graphic below explains what you’re looking at. So now what do we do? 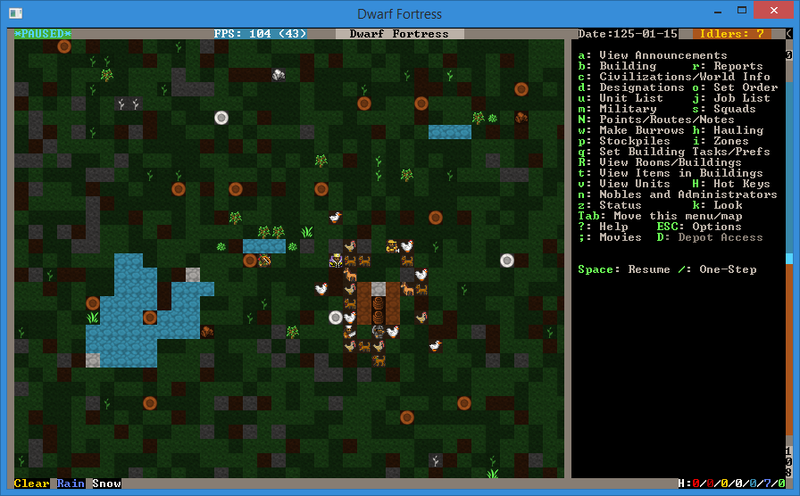 In Dwarf Fortress we’re usually trying to get a bustling community of dozens of dwarves up and running, while fending off goblins, the whims of nobles and assorted other evils. To do this we need to build ourselves a mighty fortress! Preferably underground. So lets find a cliff face to dig into and get this show on the road! Hit the d key. You’ll see the menu on the right changes and in the local view a yellow X has appeared. The menu on the right should show the Mine option highlighted. If it doesn’t, hit d again, to select it. The browned out area shows where your miners are going to come along and dig. But they won’t act until you back out of the Designations menu as the game is paused. Hit Esc and you should see the game unpause and the menu reset to its master list. Oh, when you have the d menu up you can actually click on the map with your mouse and select areas to mine. Some people prefer to select areas this way. 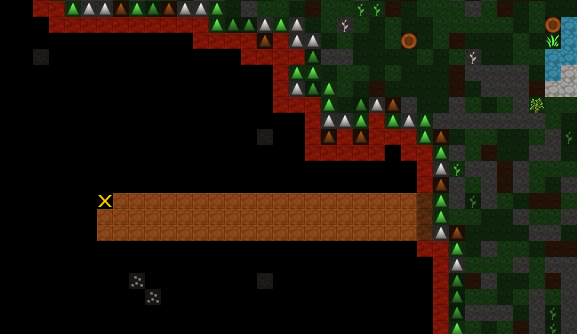 With the game unpaused you should notice two dwarves race to the cliff face and start digging. 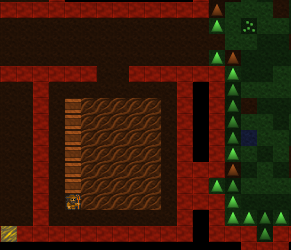 With our entrance under way we should also think about laying out some rooms for our dwarves to live in, who wants to spend time out under that hot yellow disk when lovely rock and earth beckon! See if you can match the layout below by marking out areas to dig, as you’ve learnt. If you make a mistake you can hit x from the Designations (d) menu and you’ll note that the menu on the right has Remove Designation highlighted. Now when you hit enter and select an area, any area set for digging will be cleared of that designation. Anyway, enough detail, on with the room building! Look at the little dwarves go! Aren’t they industrious! They’re quickly digging away and leaving a lot of dirt floor behind them. Good lads! Lets leave them to their work while we sort out some other important jobs. Hit d. Hopefully this time you’ll notice the game has automatically got Chop Down Trees selected, if it doesn’t, hit t and it will be highlighted. Hit d again and then p. One the right Gather Plants is now selected. Now lets sit back and watch the dwarves work for a minute! It won’t take long before our miners have cleared out our temporary living quarters and our woodcutter and plant gatherer have begun their work. Once the interior space is clear we have lots of work to do, so lets break it down into useful chunks. 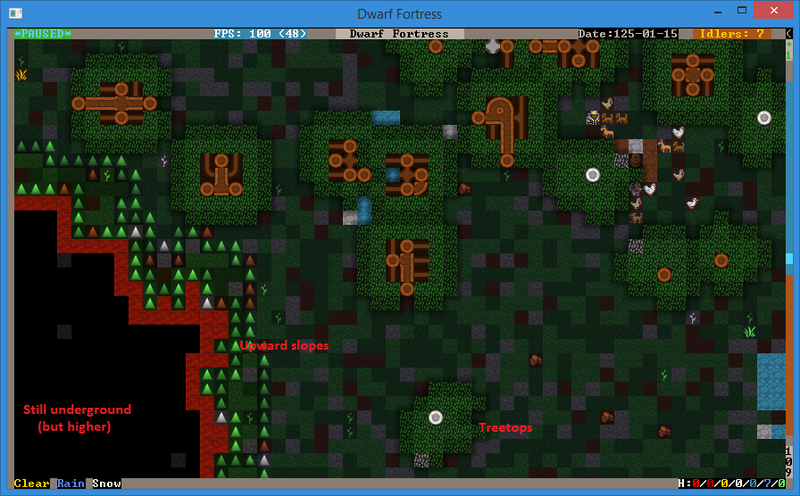 Farming is how you will make most of your food in Dwarf Fortress, and it’s important to get farming quite quickly. 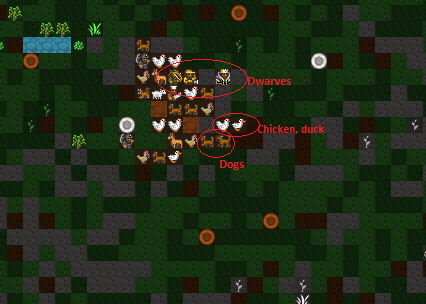 If food runs out your dwarves will starve and your game will end prematurely, and we don’t want that, right? 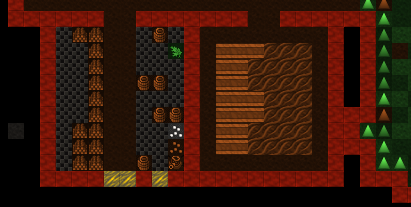 dwarves usually farm underground and handily, we have a space all prepared. So follow along, and lets get some tasty mushrooms growing for our stumpys to chow down on! Hit b for the Building menu and then p for Farm Plot. The screen instructions tell you how you can increase the size, we need a good 6 by 6 plot, so hit u and k a few times until you’ve got a big green grid, like the one below. Move the grid around with the arrow keys until it’s in about the same position as the one in the screenshot. If you get the size wrong, h and m will reduce the plot. Hit Enter and the green area marker will change to a flashing brown field marker. When stuff flashes it indicates that dwarves are on their way to come build the construction, in this case, a field. And lookee-here! A farmer has come to build our field for us! He will take a short while to build your field. 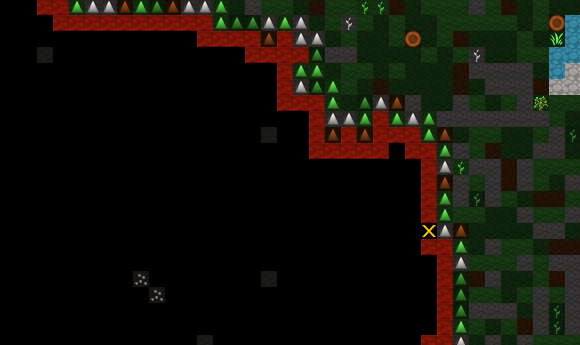 When you see the dwarf run off, you know he’s done. Now it’s time to set the field to grow delicious plump helmets all year round. Hit the q key. This is the key for Set Building Tasks and Preferences. Again you’ll notice a cursor on the local screen and if it’s anywhere near the field, the field will be flashing. You can move that cursor around with your arrow keys, this is useful later on when you need to select different workshops and buildings. What we want to do is set Plump helmets as the food to be planted every season. You can see on the top right of the menu we have the various plants we could try and grow and in the middle area we have the different seasons. Right now Dimple cups are selected (but not highlighted, note) and the season is set on Spring, as it’s Spring currently. We need to change these settings. Now comes an important skill! Menu scrolling! Using = (not the down-arrow), scroll down through the list to Plump helmets and hit enter. You should now see Plump helmets highlighted. By the way, -/= is the way to scroll in menus; DF usually uses - and +, but having to use the shift key gets annoying. Good work! But right now we’ve only set the spring planting. It’s time to set the planting for Summer, Winter and Autumn too. To do this, with the field task menu up, hit b for Summer and then scroll to Plump helmets and hit enter again. Hit c for Autumn, set Plump helmets and then d for Winter, repeating your selection. You may have noticed that what you can plant changes with the seasons, but don’t worry about that for now. Hit Esc to back out of the menu and resume the game. 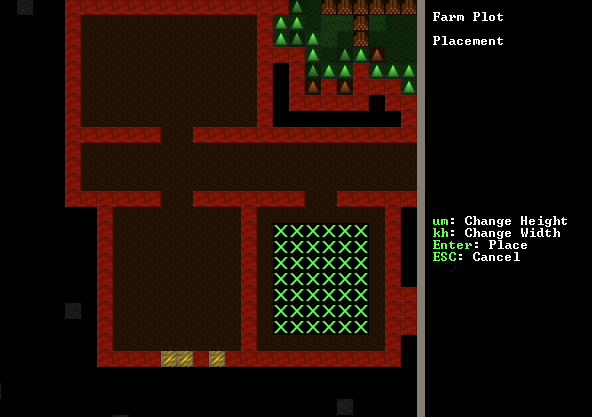 Your dwarves will quickly begin planting in your new field, well done! Oh, by now you may have noticed the announcements along the bottom of the screen. This is generally because the game wants to let you know that something important has happened. You can hit space to let the game resume, or hit a to see the alert if you miss it at the bottom of the screen). Hitting Esc will take you back out of the alerts menu and resume the game. 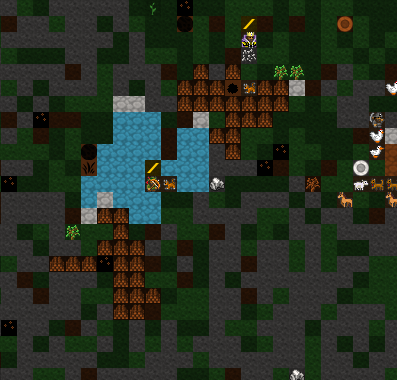 While you can just leave all of your dwarves’ stuff strewn around the countryside, it’s much more efficient to have it all inside near where it’s needed. 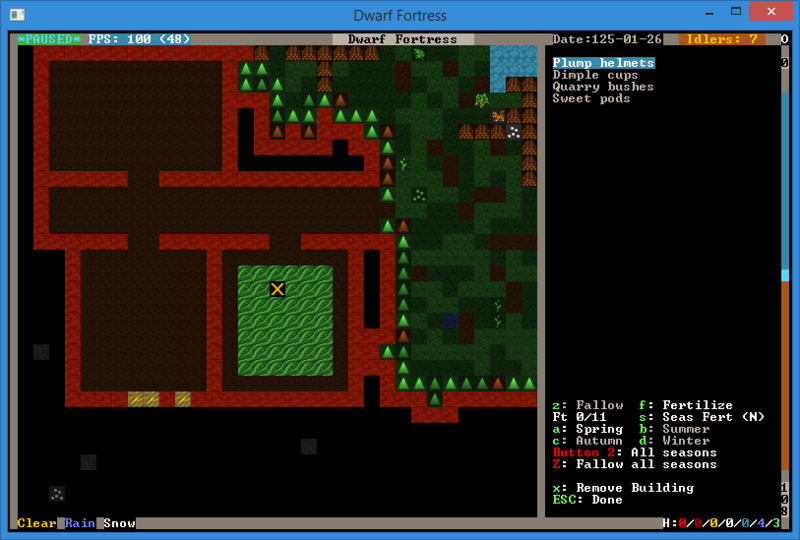 You may have noticed your farmer dwarves running in and out of the fortress to grab the seeds that they need (when they flash between their icon and a little red dot (the seed icon) you know they are carrying seeds). This is where stockpiles come in. They make everything more organised. A stockpile for all our food and seeds right next door to the farm would probably be pretty handy, right? 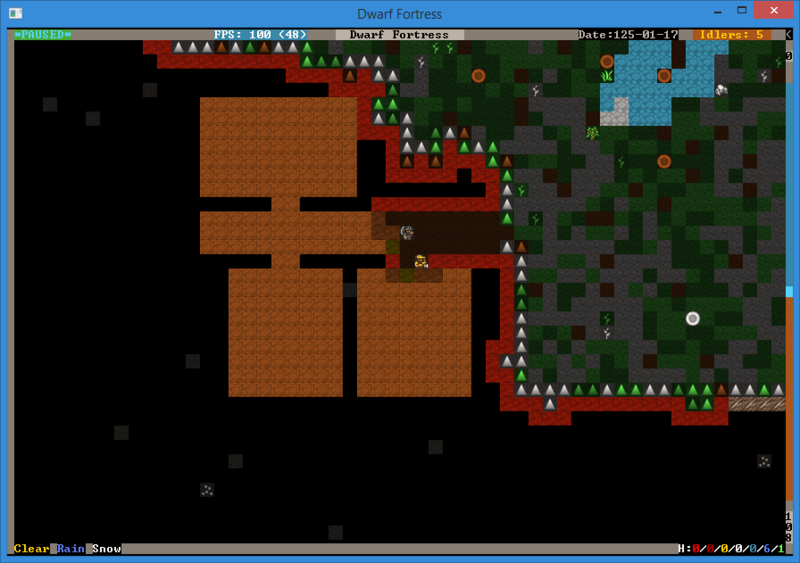 We don’t want the dwarves running across the map to get a bite to eat or a seed to plant, so lets make a food stockpile inside! Hit the p key (for “piles” of course), a cursor will appear. Hit f to select Food, we want to make a food stockpile, after all. Move the cursor to the bottom right of the room, hit enter, move it to the top center and hit enter again. You have now set that space as a food stockpile, well done! Hit w to make a Wood stockpile, and place it on the other side of the room. Before reading Chapter 2, how about setting some more plants to be gathered and more wood to be chopped. Then, head to the next installment and we’ll learn all about workshops, bedrooms, dinning rooms and stairs! It will be ever so exciting, I promise!